On Saturday, the eighth day of the ongoing London 2012 Olympics, Google demonstrates an exciting Doodle celebrating the pole vault discipline. 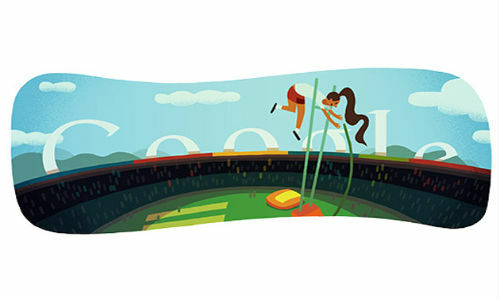 The Doodle depicts a female pole vaulter negotiating her set mark, towering over the audience and stadium. The Google logo is partially visible behind the stadium, the ceiling of which is painted in the official colors of the logo - red, blue, yellow and green. In pole vault, the athletes use a pole to propel themselves over a bar. The pole can be of any diameter or length, but the only requirement is that it should be smooth. Athletes propel themselves by balancing the pole into a box at the base of the landing area. They use their momentum and speed to bend the pole to get over the bar, set as target. The pole vault qualification rounds for men are scheduled for August 8, 2012 and the finals is on August 10. The qualification rounds and finals for women will be held on August 4 (today) and August 6 respectively. There are no pole vault participants from India in the London 2012 Olympics. London 2012 Pole Vault Doodle is the ninth Doodle demonstrated by the search engine firm. On each passing day of the Olympics 2012 Games event, Google posts a Doodle dedicated to a discipline. Google started with the opening ceremony Doodle on July 27, 2012, following which it demonstrated exciting Doodles for disciplines like Fencing, Archery, Table Tennis, Shot Put, Diving, Hockey and Artistic Gymnastics.